Assemblyman Robert Oaks (R,C-Macedon) honored North Rose-Wolcott High School student Cheyenne Boone at the January 10, 2017 school board meeting being chosen by New York State Education Commissioner MaryEllen Elia for the U.S. Presidential Scholars Program. 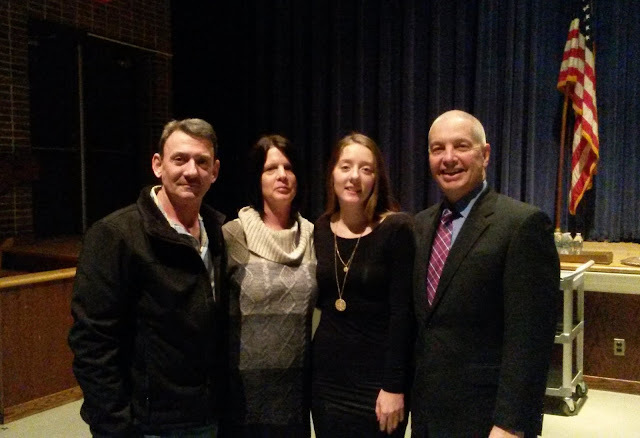 The assemblyman nominated Cheyenne for the recognition, one of the nation’s highest honors for high school students. Every year, one young man and one young woman from each state are named as Presidential Scholars. The U.S. Presidential Scholars Program was established in 1964, by executive order of the President, to recognize and honor some of our nation's most distinguished graduating high school seniors. In 1979, the program was extended to recognize students who demonstrate exceptional talent in the visual, creative and performing arts. Last year, the program was expanded to recognize student excellence in Career and Technical Education (CTE) programs. Students chosen as U.S. Presidential Scholars receive an expense-paid trip to Washington, D. C. in June and the U.S. Presidential Scholars medallion at a ceremony sponsored by the White House. During their visit to Washington, Scholars will meet important national and international figures, including government officials, educators, authors, musicians and scientists. 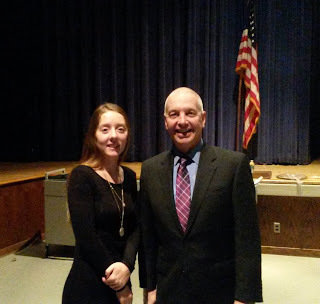 North Rose-Wolcott School Counselor Amy Beresford recommended Cheyenne to Assemblyman Oaks. Cheyenne is the daughter of John and Margaret Boone of Wayne Center Road, Lyons. Amy Beresford said Cheyenne is undecided where she will go to college and what she will study. Each fall, Assemblyman Oaks makes the request for nominees for the Presidential Scholars program and encourages school officials in every school system in the district to offer candidates. In 2016, the commissioner selected another of Oaks’ nominees, Emma May from Palmyra-Macedon, as a semi-finalist in the competition. For more information about the program, go to https://www2.ed.gov/programs/psp/about.html. 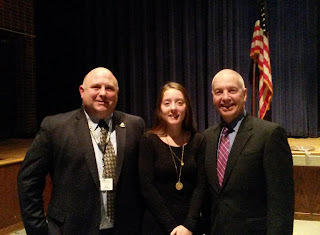 0 Comments to "Assemblyman Oaks Honors NR-W Senior Cheyenne Boone"